Based on preliminary analysis, the average annual temperature for the contiguous U.S. was 54.6°F, 2.6°F above the 20th century average. This was the third warmest year since record keeping began in 1895, behind 2012 (55.3°F) and 2016 (54.9°F), and the 21st consecutive warmer-than-average year for the U.S. (1997 through 2017). The five warmest years on record for the contiguous U.S. have all occurred since 2006. During the year, the U.S. experienced 16 weather and climate disasters with losses exceeding $1 billion, with total costs of approximately $306 billion – a new U.S. annual record. The previous costliest year for the U.S. was 2005 with losses of $215 billion driven in large part by Hurricanes Katrina, Wilma and Rita. The number of events (16) ties 2011 for most billion-dollar disasters in a single year. Some of the more noteworthy events included the western wildfire season, with total costs of $18 billion, tripling the previous U.S. annual wildfire cost record. Hurricane Harvey had total costs of $125 billion, second only to Hurricane Katrina in the 38-year period of record for billion-dollar disasters. Hurricanes Maria and Irma had total costs of $90 billion and $50 billion, respectively. Hurricane Maria now ranks as the third costliest weather and climate disaster on record for the nation and Irma ranks as the fifth costliest. For the third consecutive year, every state across the contiguous U.S. and Alaska had an above-average annual temperature. 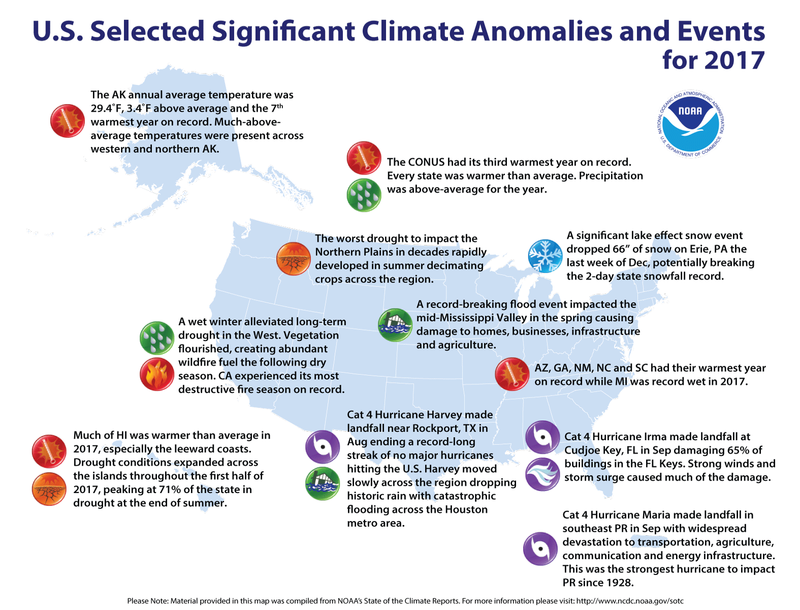 Despite cold seasons in various regions throughout the year, above-average temperatures, often record breaking, during other parts of the year more than offset any seasonal cool conditions. 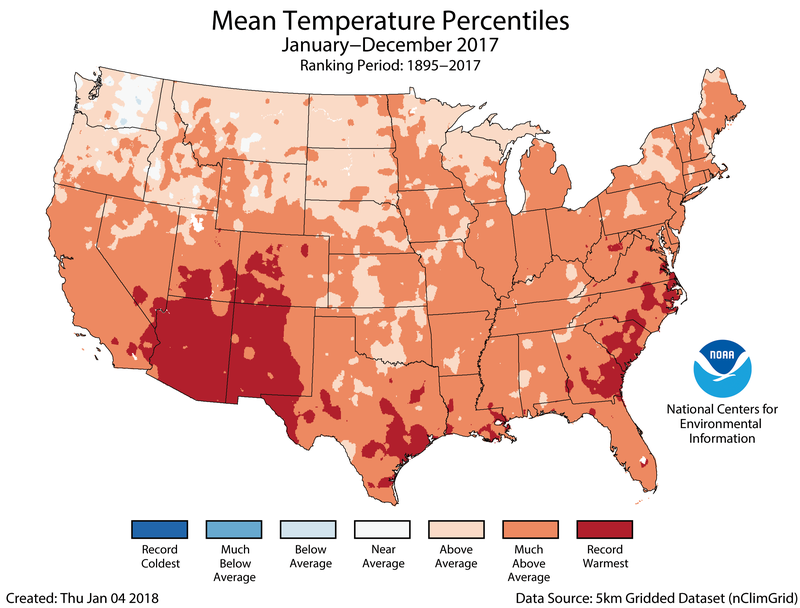 Five states – Arizona, Georgia, New Mexico, North Carolina and South Carolina – had their warmest year on record. Thirty-two additional states, including Alaska, had annual temperatures that ranked among the 10 warmest on record. The contiguous U.S. average annual precipitation was 32.21 inches, which is 2.27 inches above the long-term average. This made 2017 the 20th wettest year on record for the nation, and the fifth consecutive year with above-average precipitation. 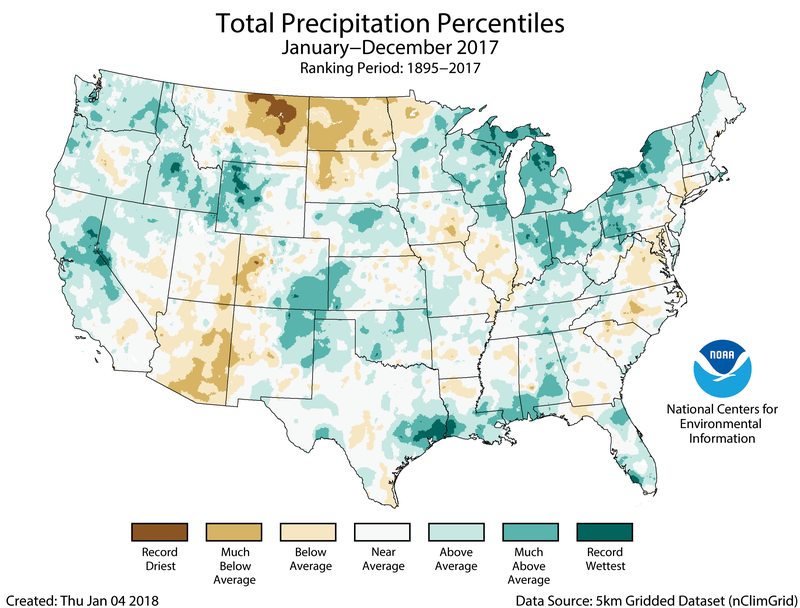 Above-average precipitation was observed across the nation with much-wetter-than-average conditions across parts of the West and the Great Lakes region. Michigan had its wettest year on record with 39.23 inches of precipitation, 8.10 inches above average. Below-average precipitation was observed in parts of the Southwest, Northern Rockies and Northern Plains. Several large-scale flooding events impacted the nation during 2017 including the record-shattering rainfall across Texas and Louisiana associated with Category 4 Hurricane Harvey – the first major hurricane to make landfall in the U.S. since in 2005. Rainfall totals exceeded 60 inches in parts of Texas with devastating floods across the Houston metro area. Another heavy rain event impacted the Mid-Mississippi Valley in April and May. Numerous tributaries of the Mississippi River had record high crests, breaching levees with widespread damage to homes, businesses, infrastructure and agriculture. Drought conditions changed dramatically throughout 2017. According to the U.S. Drought Monitor, the year began and ended with about one-quarter of the contiguous U.S. in drought. The drought footprint reached a low of 4.5 percent in late May, the smallest drought footprint in the 18-year period of record for the U.S. Drought Monitor. Heavy precipitation during the winter season caused significant flooding and record high snowpack across the West and helped to end a multiyear drought impacting California and Nevada. However, the wet winter allowed vegetation to flourish creating an abundance of fuels for wildfires during the subsequent dry season. A dry spring and summer set the stage for a rapidly expanding and intensifying drought in the Northern Plains, causing widespread agricultural impacts with total losses exceeding $1 billion. Lingering drought from 2016 in the Southeast persisted into early 2017, but beneficial precipitation helped eliminate drought conditions by summer. Dryness returned to the South in late 2017 with drought developing and expanding – especially in the Southwest, Southern Plains, Lower Mississippi Valley and Southeast. The U.S. Climate Extremes Index (USCEI) for 2017 was the second highest value in the 108-year period record at more than double the average. Only 2012 had a higher USCEI value. On the national scale, extremes in warm maximum and minimum temperatures, one-day precipitation totals, days with precipitation and landfalling tropical cyclones contributed to the elevated USCEI. The USCEI is an index that tracks extremes (falling in the upper or lower 10 percent of the record) in temperature, precipitation, drought and landfalling tropical cyclones across the contiguous U.S. There were a record-tying 16 weather and climate disasters with losses exceeding $1 billion during 2017 including three tropical cyclones, eight severe storms, two inland floods, a crop freeze, drought and wildfires causing a total of 362 direct fatalities among these events. However, 2017 arguably has more events than 2011 given that our analysis traditionally counts all U.S. billion-dollar wildfires as a single, seasonal event. 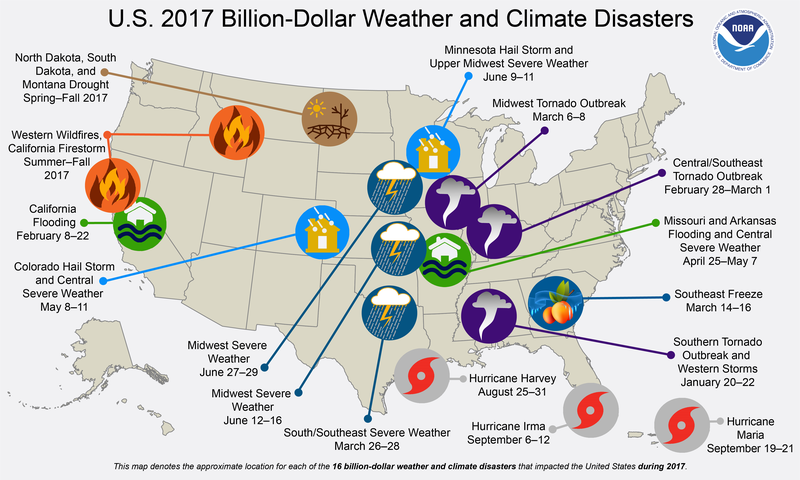 In the 38-year period of record, the U.S. has sustained 219 weather and climate disasters where the overall damage costs reached or exceeded $1 billion. The cumulative costs for these 219 events exceed $1.5 trillion. 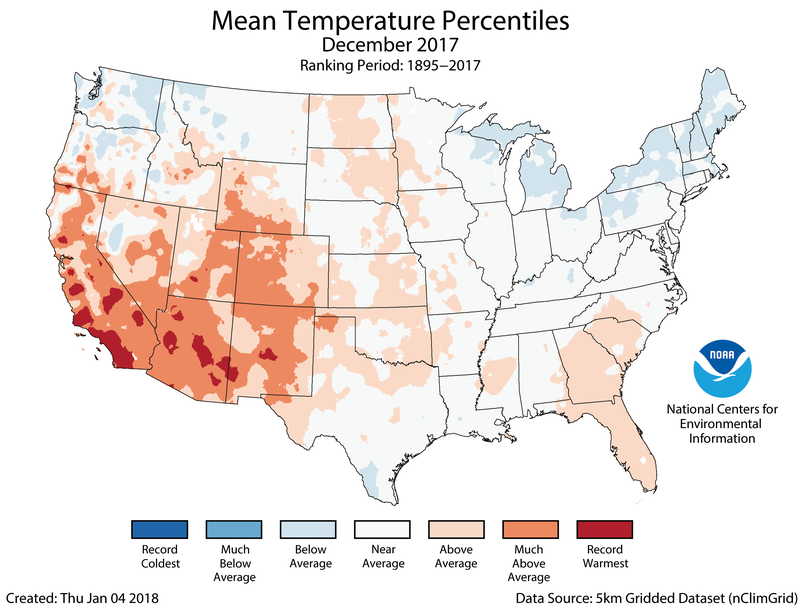 The December average temperature for the contiguous U.S. was 34.8°F, 2.1°F above average and ranked among the warmest third of the historical record. Much-above-average temperatures were observed across the Southwest with record warmth in parts of the Southwest. In California, the record warmth and below-average precipitation added to the ideal wildfire conditions during the month with several devastating and record-breaking wildfires impacting southern parts of the state. Alaska had its warmest December on record with a statewide average temperature of 19.4°F, 15.7°F above the 20th century average and 2.1°F warmer than the previous record set in 1985. Numerous locations including Barrow, McGrath, and Bettles were all record warm. Near- to below-average temperatures were observed across parts of the Northwest, Midwest and Northeast. Across the East in general, the beginning of December was marked by much-warmer-than-average conditions, but the month ended with a record and near-record cold week for many locations. The contiguous U.S. precipitation total for December was 1.55 inches, 0.80 inch below average. This was the ninth driest December on record and driest since 1989. 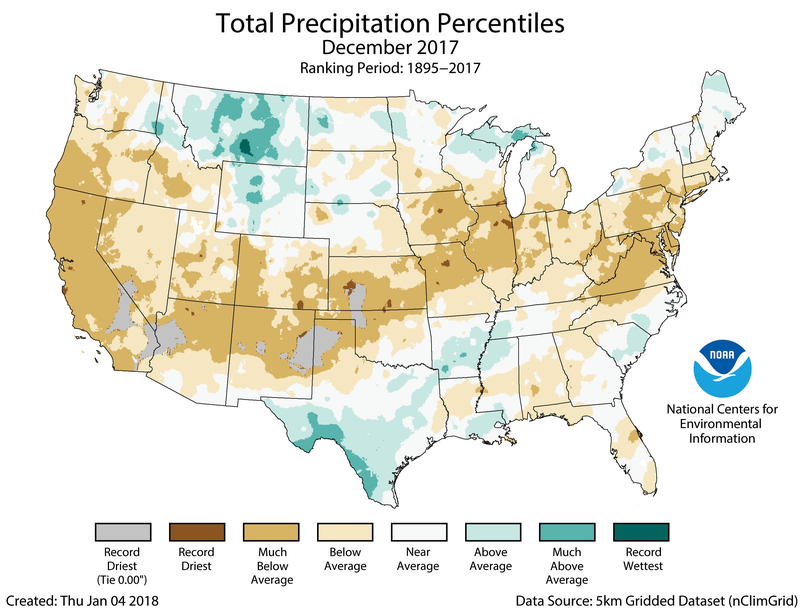 Large parts of the nation were drier than average with 15 states across the West and parts of the Central Plains, Midwest and Mid-Atlantic having much-below-average precipitation. Parts of the Northern Rockies, Southern Plains and Lower Mississippi Valley were wetter than average. According to the January 2 U.S. Drought Monitor report, 27.7 percent of the contiguous U.S. was in drought, up about 6.6 percent compared to the end of November. Drought developed, expanded and intensified in the Southwest, Southern Plains and Mid-Atlantic. Drought improved in parts of Texas, the Lower Mississippi Valley and Northern Rockies. In honor of Valentine’s Day, we take a look at typical February climate conditions and Climate Normals for several lovely locations.